OS grid reference: ST 5320 4796. The Somerset village of Wookey Hole, 1 mile west of Lower Milton, at the southern side of the Mendip Hills has become famous for its deep caves which have, over the past two-hundred years, yielded up many archaeological finds from prehistoric times, but the caves here at Wookey have been a tourist attraction from as far back as the 15th century. It is here that the River Axe emerges from beneath the caves and then flows southwards towards Haybridge. 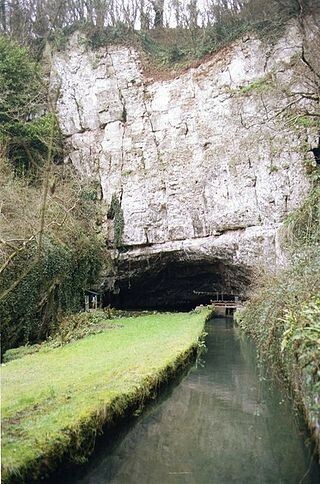 An interesting Wookey Hole Caves Museum is located at the site. Twenty-five underground chambers have been discovered by archaeologists and cave explorers, the most famous having names such as: ‘the kitchen’, ‘the Parlour’, ‘the Oast Office’ and the Great Cave itself, which has the eerie, calcified figure of a woman called ‘Witch of Wookey’, and in the entrance an image of a man called ‘the Porter’ – (Dunning, 1980). Adjoining the caves is a rock shelter called ‘Hyena Den’ and it is here that most of the finds from prehistoric times have been excavated, many artefacts in fact dating back ‘many’ thousands of years to the Palaeolithic Age. And above ‘Hyena Den’ there is yet another famous cave known as ‘the Badger Hole’, whose inhabitants were indeed “badgers”! The caves of Wookey Hole are located just to the north of the village beyond a number of mills and workings from the industrial age, along a footpath up to the southern escarpment of the Mendip Hills and the ravine where the caves are to be found. The town of Shepton Mallet lies some 3 miles to the south-east and the city of Wells is just under 3 miles in the same direction. The first phase of archaeological excavations was carried out in 1859-74 by William Boyd Dawkins and, later continued by Herbert E. Balch between 1904-14; the work continued between the years 1938-54, then again 1946-9, and then 1954-57 and, more recently in 1972. 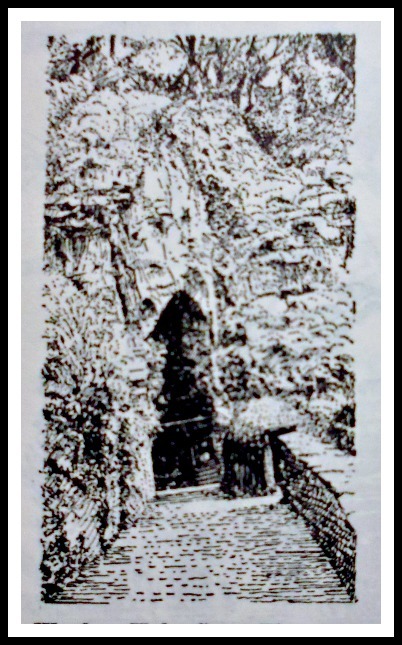 Wookey Hole Cave Entrance (illustration). “We are concerned with three caves in the ravine, all of them occupied by troglodytes though at very different periods. The first is the Hyaena Den, a small cave in the right-hand side of the ravine approached across a rustic bridge. The Hyena Den was first discovered in the middle of the nineteenth century and digging was begun there, almost in the year of the publication of the Origin of Species, under the direction of Sir William Boyd Dawkins, who was himself so much concerned in the struggle which led to recognition of the hitherto undreamt-of antiquity of man. It proved to contain vast masses of animal bones which had been lying there between twenty and a hundred thousand years. There in the heart of Somerset, Victorian gentlemen unearthed the remains of cave lion, cave and grizzly bears, mammoth, woolly rhinoceros, bison, Irish elk, and many other species including great numbers of hyaenas. These last unpleasant beasts had been responsible for dragging in many of the other species, either as prey or carrion: but not all of them, for the ashes of camp fires, burnt bones and implements of flint and chert told of the use of the cave by Old Stone Age hunters. Whether the human families had actually to expel the hyaenas before they could claim the shelter of the cave who shall say, but the place must have been foul and fetid enough with the rank smell of the dogs and their putrifying mid-dens. On the other hand, any cave was welcome in glacial winters and at Wookey the water supply was excellent. Certainly hunting parties returned to the place from time to time over a great span of years, though all within the last phase of the Old Stone Age when the glaciers having ground their way southward for the last time, alternately melted back during a slightly warmer spell or advanced again with the intensifying cold—the minor oscillations which preceded the end of the Ice Age. “Wookey Hole itself is a high, narrow entrance just above the spot at which the Axe glides out from under the precipice at the head of the ravine. It is far more spacious than the other caves, with three open chambers hung with stalactites through which the Axe flows and widens to a lake. It is now flood-lit and makes a pretty spectacle for those who like such places. More caves stretch deep into the rock below the water, and divers have already discovered seven of them—dangerous exploration which has had its fatalities. “The industrial buildings at Wookey Hole may be something of a surprise; and their contents even more so. At least since the early 17th century the emergent Axe has been harnessed to make paper, and the present buildings were put up by Hodgkinson family from the mid 19th century. High-quality hand-made paper was made here until 1972, and the whole property was sold in 1973 to Madame Tussaud’s. Since that time there have been notable changes: part of the mill houses Lady Bangor’s famous collection of fairground objects, themselves made between 1870 and 1939, including organs, gallopers from roundabouts, cars from scenic railways, and many other pieces of now almost vanished culture, resplendent in the colours and detail that could hardly be studied when the fairground was at work at night, and often at high speed. “Another part of the mill has become the working store-room and studio for Madame Tussaud’s exhibition. Heads, bodies and limbs of those whose fame has faded, and costumes and crowns, ready to take their place again in Baker Street, are there arranged neatly on shelves, together with the plaster negative moulds of those of current fame. Dunning, Robert., Somerset & Avon, John Bartholomew & Sons Limited, Edinburgh, Scotland, 1980. Hawkes, Jacquetta., A Guide To The Prehistoric And Roman Monuments in England And Wales, (Published for Cardinal by Sphere Books Ltd., London, 1975. Worcester, William., (ed. Harvey, J. H.) Itineraries (1969). Categories: Caves & Rock Shelters, Myths And Legends | Tags: Wookey Hole Caves in the Mendip Hills in Somerset | Permalink.